You have worked hard to develop relationships and build rapport with your team members and colleagues. That’s a good start. However, the ability to effectively communicate with your supervisor and other members of senior management, in addition to your team members and peers, will improve your effectiveness as a manager and team leader. Effective communication helps you strengthen the connections with your organization’s senior leadership. 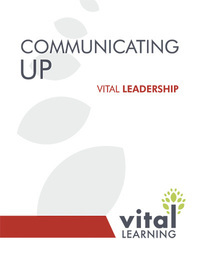 Your ability to understand a senior leader’s communication style, deliver bad news with grace, communicate group or employee achievements, and maintain their attention during a meeting are critical to ensure mutual understanding and agreement. 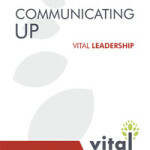 The Vital Learning Communicating Up™ course teaches supervisors, team leaders and managers how to hold more successful meetings with their managers and other members of senior leadership, transforming these meetings into positive, productive experiences. Communicating up is not difficult, but it does require employees to empathize with their managers, as well as to understand the manager’s specific style and work challenges. Click on the “e” to immediately enroll and begin the Communicating Up online course.